The Dell’Oro Group specializes in providing market research for the telecommunications, network and data center market segments to keep businesses informed about the industry. What is driving the growth of the PoE industry? IEEE has reported that PoE is “growing well beyond shipments of 100M ports per year” and the webinar noted that the figure will continue to increase with the growing adoption of 802.11ac Wireless Access Points (WAP) and the popularization of PoE lighting. 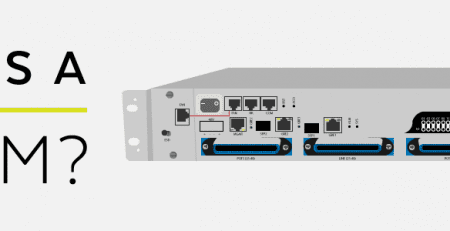 What role do Ethernet switches have in the PoE ecosystem? 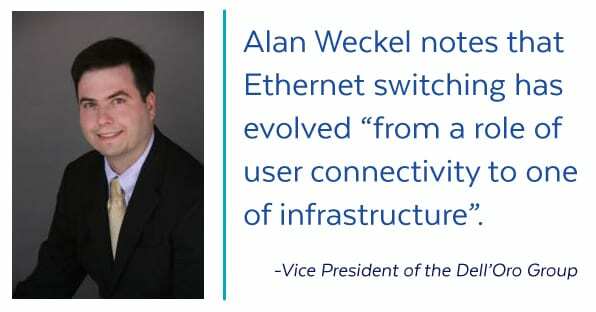 Alan Weck overviews the role that Ethernet switches have in the PoE ecosystem and notes that users are increasingly relying on WLAN (wireless local area network) as opposed to wired connections to connect to the internet. 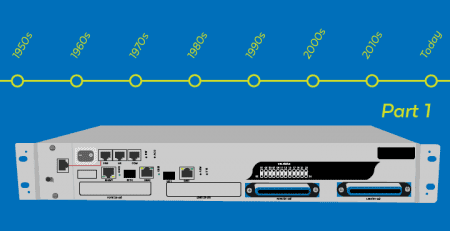 Alan Weck notes that Ethernet switching has evolved “from a role of user connectivity to one of infrastructure”. 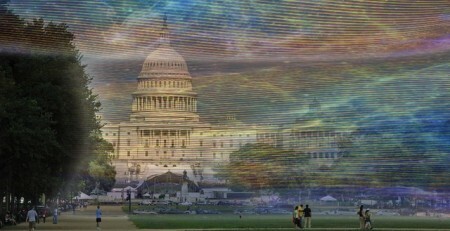 As the 802.11 Wi-Fi standards continue to improve, wireless connection performance will begin to rival the speeds of wired connections. This has become a dominant trend in mobile computing where users choose wireless connections over a wired connection. Faster WLANs will increase the demand for the adoption of faster wireless access point, and this, in turn, will increase the demand for faster Ethernet speeds beyond the current 1 GB rate. What is the main factor influencing faster Ethernet speeds? 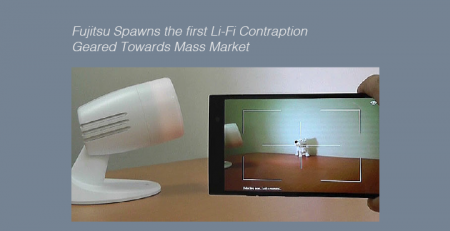 As users become increasingly mobile and rely on WLAN (Wireless Local Area Networks) to access the Internet, the demand for faster wireless access points (WAPs) will continue to increase. 802.11ax, the pre-standard faster than the current 802.11ac standard, is expected to arrive in 2019. 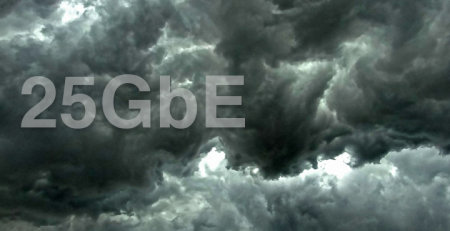 The new pre-standard promises to deliver up to 10 Gbps rates. 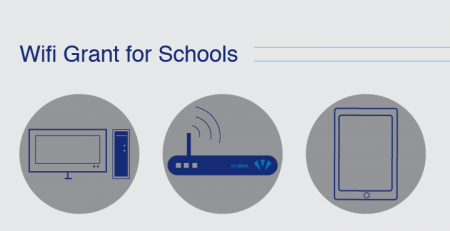 The improvement of wireless access points will push towards the adoption of 2.5 GB and 5 GB in the future. Alan Weck discusses that one of the main factors hindering the adoption of these two relatively new Ethernet rates are cost. But WLANs will continue to grow and place faster bandwidth demands on the backhaul of networks. How will IoT influence PoE Port Growth? When it comes to PoE port growth, Dell’Oro found that in terms of the Internet of Things (IoT), PoE lighting is the only sector expected to substantially fuel PoE growth. PoE lighting allows users to deploy low-powered LED lights using Power over Ethernet. This simplifies the deployment of lighting installation and removes the need for professional electrical installers and expensive electrical permits. To read more about the benefits of PoE lighting, click here. What can threaten the growth of PoE lighting? One of the main advantages that can fuel PoE lighting is the lack of legal permits needed to deploy a network. But a high volume of PoE lighting deployments running at full output power can potentially make for a fire hazard. Even though the scenario represents an extreme example, the analysts discussed the possible effects of regulation and how that would discourage new adopters. PoE is Awaiting the standardization of 802.3bt. How does the pending standard affect the Ethernet ecosystem? 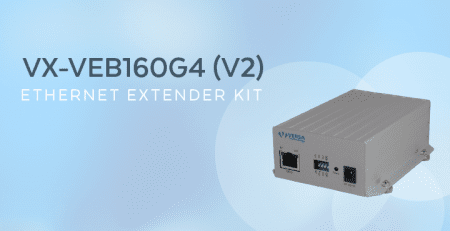 Though regulation is highly unlikely with current PoE standards, PoE is awaiting the standardization of the 802.3bt standard. The new standard promises to deliver up to 100 watts per PoE port. Power Sourcing Equipment that supports these new ultra PoE power levels justifies the fledgling concern for possible future regulation demands for the wiring technology. PoE is currently a cost-effective alternative to installing new electrical circuitry. It allows network administrators to deploy PoE in locations without the expense of electrical conduit permits. Regulation would only hinder the growth of PoE port shipments and discourage prospective PoE lighting customers from adopting the Ethernet ecosystem. Alan Weck mentioned a couple other market observations in relation to switches. 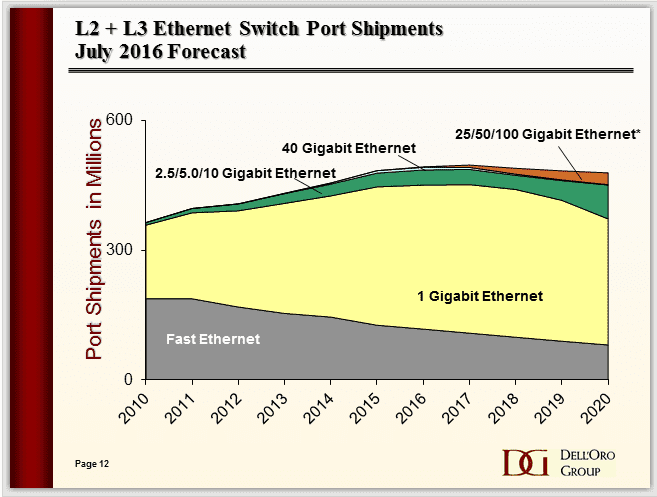 The market for Fast Ethernet switches will continue to decline. In addition, the bulk of the market will consist of 1 Gigabit Ethernet units while the 40 GB market will continue to decrease. 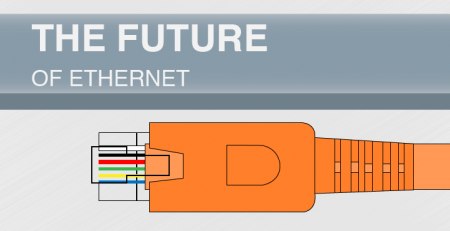 The following diagram also includes market projections for 25/50/100 GB Ethernet and 2.5/5/10 Gigabit Ethernet units. Will IP telephones or VoIP phones impact PoE port growth? IP Desk phones, as noted by Alan Weck, drove PoE port growth before 2008. With the introduction of instant messaging platforms and social media, experts predicted a sharp decline in the Enterprise IP Telephony market share. However, Dell Oro’s findings report neither a growth nor decline in IP Telephony. 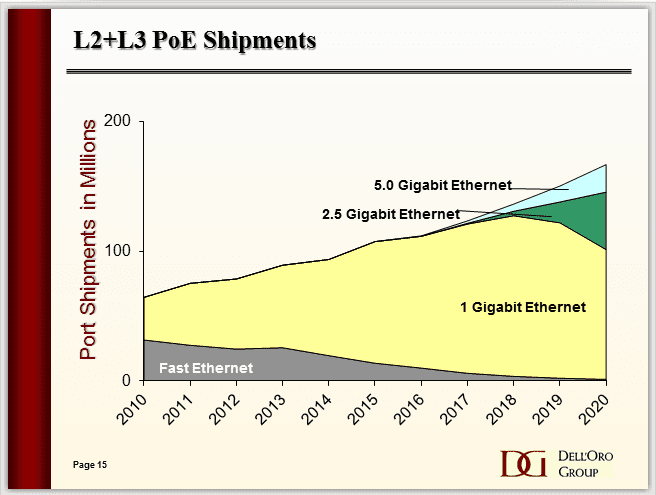 Do these market forecasts include automobile Ethernet? Unfortunately, these market forecasts do not include automobile Ethernet. Automobile Ethernet will be considered an entire breed of its own. IEEE recently introduced 802.3bw standard, which “specifies 100BASE-T- 100Mbps over a single twisted pair for automobile applications”. 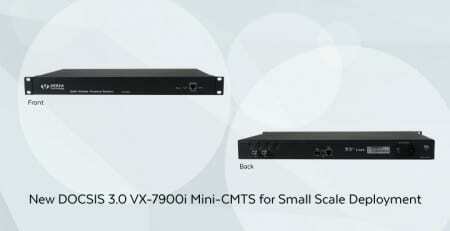 Click here to find out more about 802.3bw. Subscribe to our newsletter to receive new product notifications, deals, and offers!